When you see it happening, the Sheldon’s #30More, once-in-a-generation renovation project is larger in scope than many may have realized it would be. It’s just a little construction, right? Not really. It’s in every corner of the building, and touches every system and every surface. It’s a decade in the making undertaking. Behind the scenes, there have been reams of architectural documents, hundreds of hours of lobbying and planning meetings, and dozens of talented people contributing to a larger whole. All of the efforts have followed the Sheldon Board’s guiding principles for the project – to maximize the essential balance between preservation work that continues a vital 114 year legacy and thoughtful incorporation of contemporary amenities that lead us into the future and the next 30 years. There are so many details. And, it’s all in the details. 5. I was not aware of the flexibility of the building for multiple uses. 6 The creative scaffolding that is in place…lets the seats remain in place and lets the work be done. This week the decorative finishes contractor, Conrad Schmitt Studios, is beginning to wrap up their work on site. They’ve carefully removed damaged and peeling paint, prepped the surfaces, and reapplied everywhere it’s needed. It’s hard to comprehend without seeing it in action just how many entirely distinctive surfaces there are in this ornate space. Each one must be handled individually. 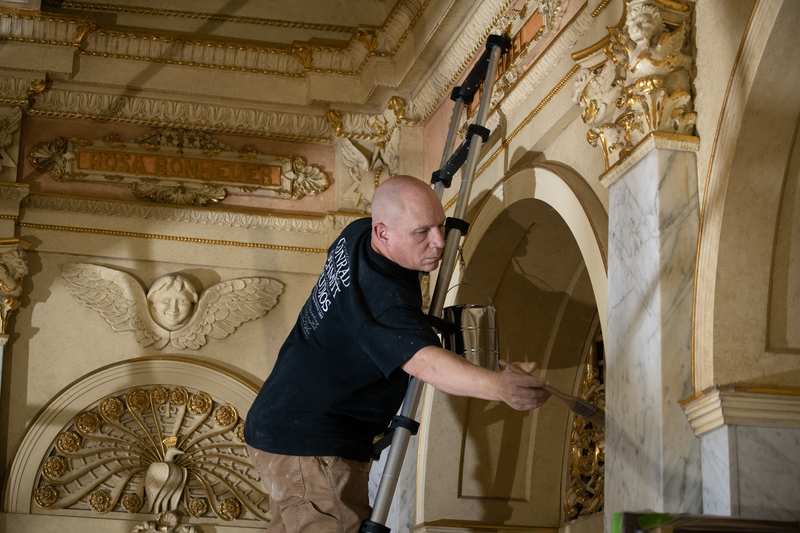 On the proscenium arch, many areas of plaster have been patch repaired by hand before finishes are applied. 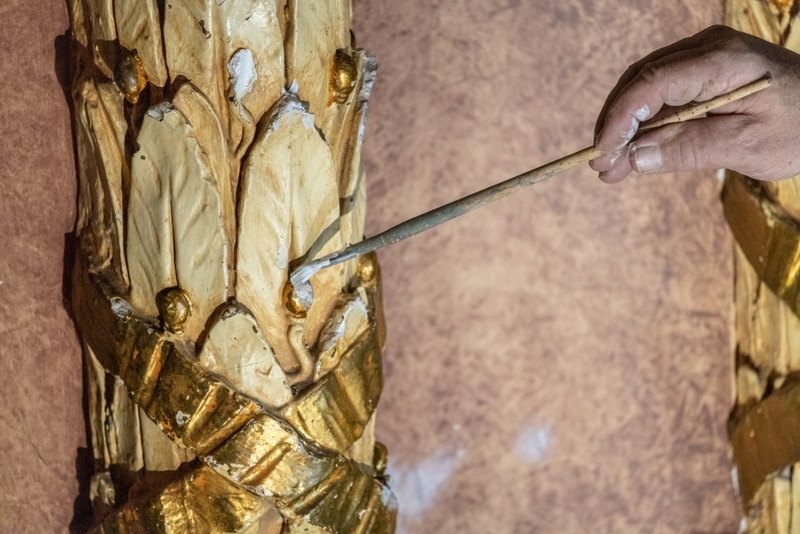 The final touches include tipping highlight areas throughout the building with 23kt gold-leaf paint. The scaffolding which took two weeks to build is now starting to be dismantled. The main entry ceiling is now whole again, after two years of a temporary plywood ceiling. In the new construction spaces – such as the public restrooms and the artist green room which were both torn out entirely and are being reimagined with modern features – renewed infrastructure is in place, and walls are now in place. You can see the shape and the coming function. The shine and the splendor is coming back as workers begin to put it all back together again. While the scaffolding was in place all the way to the ceiling, the artists touched up and took care of the Sheldon’s one-of-a-kind mural high above the proscenium. 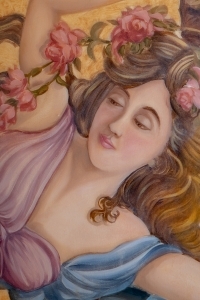 And, we were able to capture a rare, up-close view of the details that animate her welcoming, thoughtful, elegant presence as a maker and a keeper of beauty and creativity. We can’t wait to share it with you during Grand Reopening Festivities on September 29 and October 5. Paint, Paint, Everywhere! Vote for the Sheldon!